most of the damage with 5 very good wickets. On a bright and sunny day at Rubislaw FP’s made 3 changes to the side which lost to Bon Accord last week. Captain Geoff Morrison and Vice-Captain John Davey were both unavailable as was Harry Mapplebeck. They were replaced by Rob Swiergon, Sam Knudson and stand –in skipper for the day Tom Booth. The breakthrough for Ellon was not long in coming as Swiergon was very well bowled for only 1 by a good delivery from White knocking back the top of off stump. This brought Tenneti to the crease and began a crucial 2nd wicket stand for FP’s which would eventually yield 104 runs. Alex Keith was looking settled until an uncharacteristic error gave Ellon a chance at cover which was spilled. Ellon would pay for this mistake as Keith started to find the boundary regularly. The hard dry outfield meaning any ball marginally offline was likely to be punished. Tenneti was then dropped on 10 with the fielder having several goes to secure the catch before ultimately spilling it to give the FP’s another valuable life-line. Keith brought his 50 up in the 23rd over with another crashing boundary and with Tenneti looking solid at the other end FP’s sensed a decent score was on the cards. Ellon finally broke the partnership with M White bowling Keith for 74 (16 x 4’s). Wickets then began to fall with regularity as captain Booth was caught at deep extra cover off M White for 3 followed by Senthil who chipped to mid wicket off Wade’s bowling and was well caught for 4. Tenneti’s patient innings was finally ended on 41 runs when he edged to slip off Wade and was taken with a good diving catch by Parks. 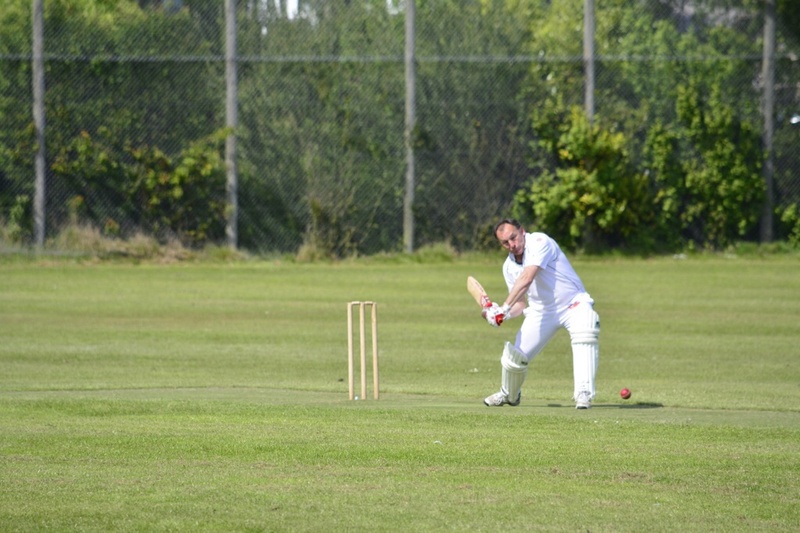 Paul McDonald was playing some typically robust shots including 2 excellent sixes, one back over the head of bowler Scott White. He was finally bowled for 26 by M White trying one too many big shots. Vijapur hit 16 runs including 3 boundaries before being caught at Long On, M White again the successful bowler. Roland Knudson was the next victim to arguably the catch of the day as he cut a fine shot to backward point only to be taken by a high one-handed catch off the bowling of M White for 1 run. This brought another swashbuckling hitter to the crease in Sajid Hameed who smashed a quick and very entertaining 24 before being bowled in the final over by Wade. Sam Knudson and Stuart were left not out at the end on 7 and 4 runs respectively. FP’s posting a very competitive 227 for 9. FP’s have been quick starters with the ball in hand so far this season and this again proved to be the case on Saturday as Vijapur struck first over to hold onto one hit back towards him and remove S Davies caught & bowled for 4. Hameed was next in on the act bowling Veldsman for 9 in the 4th over. C White didn’t last long scoring only 1 before being beautifully bowled by Vijapur as FP’s took control of the match. 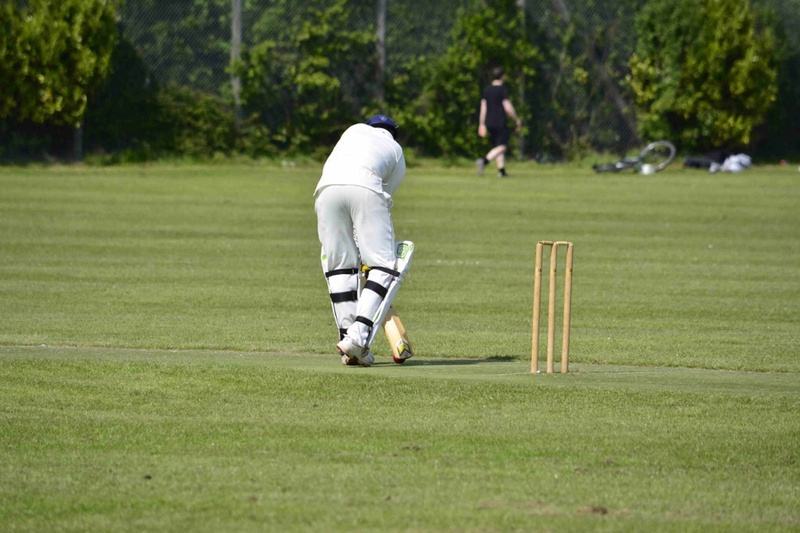 However they were made to wait for the 4th wicket as S White and A Ahmed put on a stand of 90 with Ahmed in particular demonstrating some very powerful hitting in his 59. Roland Knudson’s spin did manage to bamboozle Ahmed on occasion but ultimately couldn’t bring the wicket. The key breakthrough came when Tenneti’s held a wonderful low catch off the bowling of Sam Knudson to remove S White for 40. This opened the door for FP’s and wickets began to tumble. Ahmed was well stumped by Booth off the bowling of Sam Knudson and Vijapur’s return brought about the wicket of Webb bowled for 11. Sam Knudson and Booth then combined for a run out when Greenfield chased a quick single and departed for 2. M White then had his leg stump cart- wheeled out of the ground by Hameed as FP’s sensed victory. The final two wickets were taken in consecutive balls as Vijapur cleaned up Sharma, bowled off his pads for 11 and then took Wade LBW for 0. Parks was left the not out batsman on 2. Overall the game was played in good spirit and well officiated by umpire Mike Philip who had very little controversial decisions to make on the day. Champagne Moment – Tenneti’s excellent diving catch to remove S White broke a crucial stand that could have taken the game away from FP’s. Quite possibly the best match report I’ve ever read!